Products that I use and know that work extremely well. 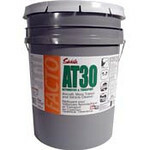 Facto AT30 available from Swish is a water based degreaser that I have been using since 1986. I have found none that is better.